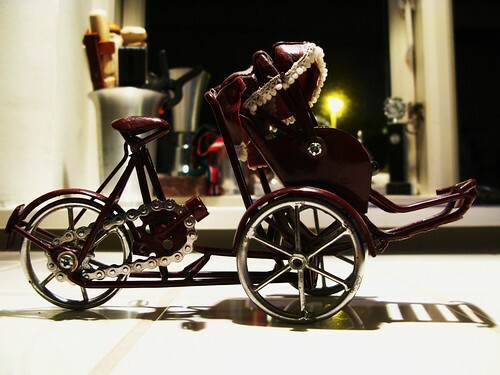 A lovely working model of a tuktuk bike rickshaw as seen in the bedroom of a boy I know. If you're ever in Vienna, pay a visit to the Embacher Collection. Loads of bikes to look at. They have a website, too. The English version looks like it was translated by an online translation tool but it works. This is what they write about the Long John. "The only two-wheeler load-carrying bike with a maximum load of around 140 kg (incl. rider). Nevertheless, the load can suspiciously be balanced out easily, something that passers-by find hard to believe. On start there are many onlookers and the other awestruck bike-lane users make space when they are being."